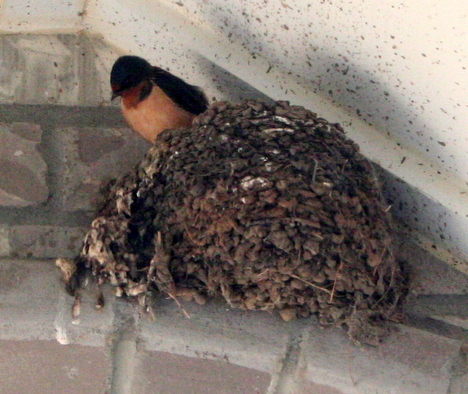 The swallows have returned and are reclaiming their home. I wonder if they’ll have two clutches again this year. It’s time to pressure wash the front porch and put the mat underneath the nest. I now have 3 swallow nests and new one beginning. I really love to watch the birds but the droppings are now on the front entrance. Do you have any ideas on how to make them move? Oh, you want the birds to move? I have no (good) ideas. Loud music? Bright lights? A ramp for the neighborhood cats? Break the nests? Or do what I did and put a mat underneath the nests.